From "The Nature of Animal Light", by E. Newton Harvey. Modern physical theory supposes that light is a succession of wave pulses in the ether caused by vibrating electrons. The light to which we are most accustomed—sunlight, electric light, gaslight, etc.,—is due to electrical phenomena connected more or less directly with the high temperature of the source of the light. Every solid body above the temperature of absolute zero is giving off waves of different wave-length (λ) and frequency (ν) but of the same velocity (υ), in vacuo, 180,000 miles, or 300,000 kilometres a second. In fact, υ (a constant)=λν, so that it is only necessary to designate the wave-length in order to characterize the waves. This is radiant energy or radiant flux. them. Thus, a white-hot object liberates radiant energy or flux of many different wave-lengths corresponding to what we know as "heat, light and actinic rays." All can be dispersed by prisms of one or another appropriate material to form a wide continuous spectrum, such as that indicated in Fig. 1. Radiant energy of λ=.76µ to λ=.4µ, evaluated according to its capacity to produce the sensation of light, is spoken of as visible radiation or luminous flux. Below the infra-red comes a region of wave-length as yet uninvestigated, and beyond this may be placed the Hertzian electric waves of long wave-length used in wireless telegraphy. 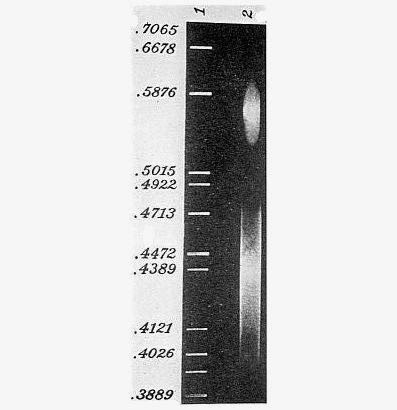 Above the ultra-violet comes another region as yet uninvestigated, and then Röntgen rays (X-rays) and radium rays, of exceedingly short wave-length. These last types need not concern us except in that we may later inquire if they are given off by luminous animals. The shortest of the ultra-violet are known as Schumann and Lyman rays. Wave-lengths of light are usually given in Ångstrom units. One micron (µ)=.001 mm.=1000 millimicrons (µµ)=10,000 Ångstrom units (Å) or tenth metres=10-10 metres or 10-8 centimetres. The entire scale of wave-lengths extends from 106 to 10-9 centimetres. Hertzian electric waves (upper limit not reached) above 12 km. to .16 cm. Fig. 1.—Schematic representation of various types of radiation to form a wide continuous spectrum. The total radiant energy which a body emits is a function of its temperature and for a perfect radiator, or what is known as a black body, the total radiation varies as the fourth power of the absolute temperature, T. (Stefan-Boltzmann Law). The radiant energy emitted at different wave-lengths is not the same but more energy is emitted at one particular wave-length (λmax.) than at longer or shorter ones, depending also on the temperature. If the various waves are intercepted in some way, their relative energy can be measured by an appropriate instrument and spectral energy curves can be drawn, showing the distribution of energy throughout the spectrum. Fig. 2 gives a few of the curves, and it will be noted that the maximum shifts toward the shorter waves the higher the temperature. In fact, for a black body λmax.×T=2890, and at 5000° C. (about the temperature of the sun) λmax. lies within the visible spectrum. In gas or electric lights it lies in the infra-red region. The area enclosed by these spectral energy curves represents the total energy emitted, and, knowing this and the area enclosed by the curve of visible radiation, it is easy to determine how efficient a source of light is as a light-producing body. We shall inquire more fully into this question in Chapter III, in considering the efficiency of the firefly as a source of light. Thermoluminescence.—Some substances begin to emit light of shorter wave-length than red, well below 525°. This is thermoluminescence. Diamond, marble, and fluorite are examples. Only certain varieties of fluorite show the phenomenon well. A crystal of one of these varieties heated in the bunsen flame on an iron spoon will give off a white light long before any trace of redness appears in the iron. Other crystals may luminesce in hot water. In all, this luminescence is dependent on a previous illumination or radiation of the crystal. If kept in the dark for a long time no trace of light appears when fluorite is placed at a temperature of 100°, but after a short exposure to the light of an incandescent bulb, although no light can be observed in the fluorite at room temperature, quite a bright glow appears at 100°. Calcium, barium, strontium, magnesium and other sulphates containing traces of manganese sulphate, show a similar phenomenon after exposure to cathode rays (Wiedemann and Schmidt, 1895 b). They emit light during bombardment, but this soon ceases when the rays are cut off. If the sulphates are now heated they give off light, red in the case of MgSO4 + MnSO4, green in the case of CaSO4 + MnSO4. The power to emit light on heating may be retained for months after the exposure to cathode rays. The emission of light by bodies after previous illumination or radiation is called phosphorescence and will be considered below. It would seem that the cases of thermoluminescence with which we are acquainted are really cases of phosphorescence intensified by rise of temperature. The spectrum of thermoluminescent bodies, also, is similar to that of phosphorescent ones. (See Fig. 3) However, not all phosphorescent materials are also thermoluminescent. The production of light by animals is quite another phenomenon from thermoluminescence. Phosphorescence and Fluorescence.—Although the word phosphorescence has been used in a very loose way to indicate all kinds of luminescence, and particularly that of phosphorus or of luminous animals, to the physicist it has a very definite meaning, namely, the absorption of radiant energy by substances which afterwards give this off as light. Phosphorescence does not strictly apply to the light of white phosphorus. If the radiant energy is light (visible or ultra-violet) we speak of photoluminescence, if cathode rays we have cathodoluminescence, if anode rays, anodoluminescence, and if X-rays (Röntgen rays) we have radioluminescence. Inasmuch as the α, β, and γ rays of radium correspond to the anode, cathode, and X-rays, respectively, radium radiation also produces luminescence in many kinds of material. If the material gives off the light only during the time it is radiated we speak of fluorescence; if the light persists we speak of phosphorescence. The distinction is perhaps a purely arbitrary one, as there are a great many substances which give off light for only a fraction of a second (1/5000 sec. in some cases) after being illuminated (photoluminescence). Some substances also, which fluoresce at ordinary temperatures, will phosphoresce at low temperatures. Phosphorescence is exhibited chiefly by solids, fluorescence also by liquids and vapors. another hole sees it at the moment it is not illuminated and can thus tell if it is phosphorescing. By determining the rate of revolution of the disks it is easy to calculate how long the phosphorescence persists. While relatively few solids phosphoresce after exposure to light at ordinary temperature a large number of these acquire the property at the temperature of liquid air. Included in the list are such biological products as urea, salicylic acid, starch, glue and egg shells. The temperature also affects the wave-length and hence the color of the light given off. Usually the higher the temperature the shorter the wave-length, but in the case of some bodies (SrS) the wave-lengths become longer at the higher temperature. Li3(PO4)2 or some other fusible salt constitute a "phosphor." A "phosphor" is in reality an example of a solid solution and is the basis of some kinds of luminous paints. The intensity and duration of a phosphorescent light depend chiefly on the nature of the exciting rays, the color chiefly on the impurity present but the alkaline earth metal also exerts an influence. Rise in temperature increases the intensity but diminishes the duration, so that the total amount of light emitted is about constant at different temperatures. The spectrum of most phosphorescent substances is made up of one or more continuous bands having maxima at different wave-lengths. In the light incident on a phosphorescent substance are also bands of light rays which are absorbed and whose wave-lengths are more efficient than others in stimulating phosphorescence. These bands in the phosphorescent light are usually of longer wave-length than those in the light which excites the phosphorescence. This fact is known as Stokes' Law, but it has been found not to be universally true. Curiously enough, red and infra-red rays have the power of annulling phosphorescence after a momentary increase in brightness and phosphorescing materials have been used to determine if infra-red rays are given off in the light of the firefly. Ives (1910) showed that infra-red radiation had no power of quenching the light of the firefly as it does the phosphorescent light of Sidot blende (ZnS), one fact tending to show that the firefly's light is not due to phosphorescence. Fig. 3 is a reproduction of a photograph of the phosphorescence spectrum of ZnS. Fig. 3. Spectrum of zinc sulphide phosphorescence (after Ives and Luckiesh). 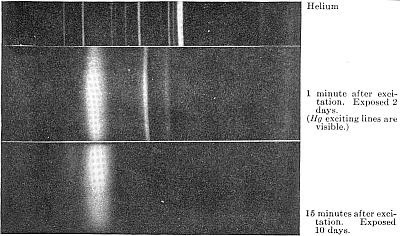 Photographs were taken by a special device one minute (middle) and fifteen minutes (bottom) after exposure to the light of the mercury arc and compared with a helium spectrum (top). In the middle photograph, the mercury exciting lines are visible. It will be noted that the narrow band of phosphorescent light does not shift its position during decay of phosphorescence. teria will continue to luminesce although they are grown in the dark for many weeks. Indeed strong light has a bactericidal action on these forms similar to that with ordinary bacteria. With some marine forms light has an inhibiting effect. They lose their power of luminescence during the day and only regain it at dusk or when kept in the dark for some time. Indeed, ordinary light never has the effect of causing luminescence in the same sense as it causes phosphorescence of CaS. Fluorescence is most efficiently excited by the cathode rays of a vacuum tube. They not only cause the residual gas in the tube to glow (electroluminescence) by which their path may be followed with the eye, but also a vivid fluorescence of the glass walls of the tube, yellow green with sodium glass, blue green with lead and lithium glass. LiCl2 in the path of cathode rays gives off a blue light; in the path of anode rays a red light; NaCl a blue cathodoluminescence and a yellow anodoluminescence. The spectrum of the latter is a line spectrum of Li or Na, showing the characteristic red or yellow lines similar to those observed where Li or Na is held in the bunsen flame. The spectrum of the salts under excitation of cathode rays is a short continuous one in the blue region. Fluorescent spectra in general are of this nature, made up of short bands of light in one or more regions. used at the present time is ZnS containing a trace of radium salt. The rays of the radium continually emitted cause a steady fluorescence of the ZnS. Indeed, if one examines the paint on the hands of a watch with a lens the flash of light from the impact of alpha particles on the ZnS can be distinctly seen, as in the spinthariscope. Some animal tissues and fluids, especially the lens of the eye, will luminesce in the path of radium rays, as shown by the experiments of Exner (1903), but there is no evidence that luminous animals are especially active in this respect. Ultra-violet rays have the same action. The luminous material of practically all luminous forms, if dessicated sufficiently rapidly, can be obtained in the form of a dry powder which will give off light when moistened with water. Coblentz (1912) has exposed this dry material to light, to the ultra-violet spark, and to X-rays and in no case has a phosphorescence or fluorescence ever been observed. I have examined the action of radium upon Cypridina light. There was no intensifying or diminishing effect of twenty milligrams of radium (probably the bromide) on a luminous solution of Cypridina material, nor was phosphorescence or fluorescence excited in a non-luminous extract of the animal. We must conclude that animal light is not a fluorescence of any substance due to radiation produced by the animals themselves. bluish fluorescence of quinine sulphate is really an emission rather than a reflection of light. But a test tube of quinine sulphate solution held in the ultra-violet region of a spectrum will glow with a pale blue light, although it is not illuminated with any rays that are visible to our eyes. Concerning this, Stokes, to whom the word fluorescence and much of our knowledge of the subject is due, says, "It was certainly a curious sight to see the tube" (containing quinine sulphate solution) "instantaneously lighted up when plunged into the invisible rays; it was literally 'darkness visible.'" Quinine sulphate absorbs the ultra-violet converting these rays into visible blue ones. Its spectrum is a short continuous one. Most fluorescent substances convert short into longer wave-lengths (Stokes' Law), but some may cause the reverse change. the light production. A trace of alkali usually increases and acid inhibits the fluorescence of solutions. Fig. 4.—Spectrum of fluorescent substance found in fireflies below (2) and of firefly luminescence above (2) compared with helium vacuum tube (1) (after Coblentz). Triboluminescence and Piezoluminescence.—Under this head are grouped a number of light phenomena which at first sight may appear to be electrical in nature but in reality are not. The light is produced by shaking, rubbing, or crushing crystals, and only crystalline bodies appear to show triboluminescence orpiezoluminescence. A striking case is that of uranium nitrate. Gentle agitation of the crystals is sufficient to give off sparks of light which much resemble the scintillations of dinoflagellates when sea-water containing these animals is agitated. If Romberg's phosphorus, which is fused CaCl2, is rubbed on the sleeve, it glows with a greenish light. Lumps of cane sugar rubbed together will glow. Saccharin crystals will also light if shaken and Pope (1899) found that the bluish light of saccharin was bright enough to be visible in a room in daytime. It only appeared from impure crystals and freshly crystallized specimens. Other crystals, also, have been found to lose their power of lighting after a time. Among biological substances, cane sugar, milk sugar, mannite, hippuric acid, asparagin, r-tartaric acid, l-malic acid, vanillin, cocaine, atropin, benzoic acid, and many others show triboluminescence. A long list is given by Tschugaeff (1901), by Trautz (1905), and by Gernez (1905). The spectrum is a short continuous one, the waves emitted depending on the kind of crystal. Thus the color of the light varies among different santonin derivatives from yellow to green. In saccharin it is blue. rubbing or shaking the animals, it is in reality fundamentally different since it is dependent on the presence of oxygen whereas triboluminescence is not. luminescence and triboluminescence of AsCl3 and of K2SO4. By photographing the luminescence through color screens of different absorptive power (Weiser, 1918, a) a spectrum of the light could be obtained, and it was found to be identical in both the tribo- and crystalloluminescent light; in the case of AsCl3, a band in the green-blue, blue and violet. Weiser believes the light in this case also to come from recombination of the ions, As+++ + 3Cl- = AsCl3, and that crystalloluminescence in general is due to rapid reformation of molecules from ions broken up by electrolytic dissociation while triboluminescence is due to rapid reformation of molecules from ions broken up by violent disruption of the crystal. Of course in triboluminescent organic crystals which do not dissociate into ions, some other reaction must be responsible for the light. One thing seems certain, that the two types of luminescence are similar. As Bigelow remarks, "It is altogether probable that the cause of this" (crystalloluminescence) "whatever it may be, is the same as the cause of triboluminescence, whatever that may be." serves as a reflector. Its significance will be discussed in a later chapter. Fig. 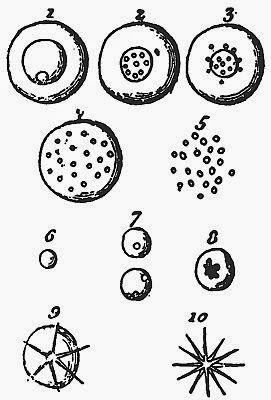 5.—Dubois's figures showing transformation of photogenic granules to crystals (after Dubois). The light of luminous organisms is quite generally associated with granules. In one of the centipedes (Orya barbarica), which produces a luminous secretion, Dubois (1893) has described the transformation of these granules into crystals and at one time he supposed the light to be a crystalloluminescence. He later reversed this opinion and, certainly, examination of his drawing, Fig. 5 above, does not convince one of the actuality of crystal formation. Wiedemann and Schmidt (1895) as a light accompanying the solution of colored (from exposure to cathode rays) crystals of Li, Na, or K chlorides, is probably due to a triboluminescence from stirring of the crystals during solution. Chemiluminescence.—As the name implies, chemiluminescence is the production of light during a chemical reaction at low temperatures. This does not mean that the other types of luminescence are not connected with chemical reactions—using the word reaction in a broad sense—for we have reason to believe that in some cases spectra are not characteristic of the element as such but are rather characteristic of a particular reaction in which the element takes part (dissociation into ions, changes from monovalent to bivalent condition, etc.) and that this is the reason one element may show various spectra under different conditions (Bancroft, 1913). The chemiluminescences are rather oxidation reactions involving the absorption of gaseous or dissolved oxygen and may be very easily distinguished from all the previously mentioned luminescences by this criterion. They should, perhaps, more properly be calledoxyluminescences. The glow of phosphorus is the best known case, recognized since phosphorus was first prepared by Brandt in 1669. It is interesting to note that when first prepared phosphorus was regarded as a peculiarly persistent type of phosphor, i.e., a material akin to the impure alkaline earth sulphides. Fresh cut surfaces of Na and K metal will glow in the dark for some time, especially if warmed to 60°-70° (Linnemann, 1858). A film of oxide is formed over the surface, showing definitely that oxidation has occurred. Ozone oxidizes organic matter with an accompanying glow (Fahrig, 1890; Otto, 1896). The light from ozone acting on pyrogallol solution is especially bright under certain conditions. ture of pyrogallol, formaldehyde, K2CO3 and H2O2. As I have shown, pyrogallol can be oxidized in a great many different ways, and some of these are of great interest, for they very closely imitate the mechanism for the production of light in organisms. These are recorded below, which also includes various other types of oxyluminescence of general or biological interest. 1. Oxidation in air spontaneously. ski (1880) found the light of lophin oxidized in alcoholic caustic alkali, examined with a two-prism spectroscope, to give a continuous spectrum, brightest at E, with the red and violet ends lacking. Trautz (1905, p. 101) states that the pyrogallol-formaldehyde-Na2CO3-H2O2 reaction gives a continuous spectrum from the red to the blue green with maximum brightness in the orange. Weiser (1918 a) has studied the spectra of some chemiluminescent reactions by photographing the light behind a series of color screens. He finds also that the spectra are short, with maximum intensity in various regions. Thus, amarinoxidized by chlorine or bromine, extends from the yellow to greenish blue with a maximum in the green while phosphorus, dissolved in glacial acetic acid and oxidized with H2O2, luminesces from yellow green to violet. The spectra of luminous animals are quite similar to those of chemiluminescent reactions. Moreover, as we have seen, chemiluminescence is essentially an oxyluminescence, since oxygen is necessary for the reaction. All luminous animals also require oxygen for light production. Therefore, bioluminescence and chemiluminescence are similar phenomena and they differ from all the other forms of luminescence which we have considered. The light from luminous animals is due to the oxidation of some substance produced in their cells, and when we can write the structural formula of this photogenic substance and tell how the oxidation proceeds, the problem of light production in animals will be solved.